WMSRDC is also responsible for the management and administration of the homeland security program for the counties of Clare, Ionia, Isabella, Kent, Lake, Mason, Mecosta, Montcalm, Muskegon, Newaygo, Oceana, Osceola, and Ottawa. WMSRDC is also the planning agency for the metropolitan transportation planning (MPO) program for Muskegon and Northern Ottawa Counties. 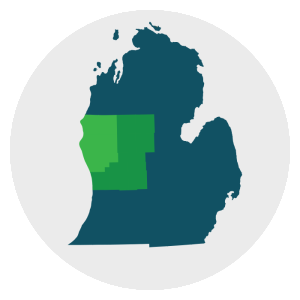 The mission of the Commission is to promote and foster regional development in West Michigan through cooperation amongst local governments and other regional partners. WMSRDC provides services and manages and administers programs in homeland security, transportation planning, economic development, environmental planning, community development, local government services, and other special projects. The United States Department of Commerce, Economic Development Administration (EDA) has made over 40 investments in the region since 1966, most of which were facilitated by WMSRDC. Approximately 40-50 projects seeking federal funds are sent to the Commission for the Federal Project Review System each year. WMSRDC is working with West Michigan Watershed groups and regional planning partners to develop a West Michigan Water Quality Plan and a funding strategy to implement clean water practices. On average, WMSRDC completes two to three Master Plans and/or Recreation Plans for local communities per year. WMSRDC’s Kathy Evans was inducted into the Michigan Environmental Hall of Fame in 2015. WMSRDC offers GIS mapping and printing services to communities in the region. WMSRDC has been the fiduciary for the Region 6 Homeland Security Planning Board since 2007. In 2012 WMSRDC became the first and only regional council in the United States to sign a contract with a dog! Yes, that is true. WMSRDC signed a contract with Environmental Canine Services (ECS) for a Muskegon Lake Watershed Project to identify problem areas of sewage leaks. WMSRDC celebrated its 45th anniversary in the year 2015. The Region 14 Rural Transportation Task Force, administered by WMSRDC, invested over $4,000,000 of federal funding, combined with state and local funding, in rural transportation projects in Lake, Mason, Muskegon, Newaygo, and Oceana counties in FY 2016. WMSRDC implemented over $10 million of natural fish and wildlife habitat restoration along the Muskegon Lake shoreline from 2009-2013 with American Reinvestment and Recovery Act/NOAA grant funds. Another $12 million has been implemented in the watershed. WMSRDC publishes a bi-monthly newsletter that is mailed to over 500 recipients. The newsletter is also available on this website. WMSRDC began administering the Region 14 Rural Transportation Task Force in 2012. WMSRDC is collaborating with a four-state Lake Michigan Trail Network to promote development of a multi-modal trail network and a 1,600 mile continuous loop non-motorized water trail around Lake Michigan. 91% of residents surveyed are aware of Clean Air Action Days due to the cooperative efforts of WMSRDC’s Clean Air Action Program and the West Michigan Clean Air Coalition.WMSRDC continues to host a series of regional forums developed to help local communities learn more about pertinent planning and development subjects. WMSRDC is currently implementing $12 million of fish and wildlife restoration and water quality improvements in the Muskegon River/Muskegon Lake Watershed with Great Lakes Restoration Initiative/NOAA funds. In 2015 WMSRDC administered over $35 million in federal, state, and local transportation projects (highway and transit) through the MPO program. WMSRDC was designated an Economic Development District (EDD) by the U.S. Department of Commerce, Economic Development Administration (EDA) in 1975. WMSRDC maintains that designation to this day.